The Cumberland & Dumfriesshire Farmers Mart had forward 1,831 ewes with lambs at foot and store hoggs at their sale at Longtown on Tuesday 3rd May, 2011. All classes of ewes with lambs were a great trade to an ever increasing demand. 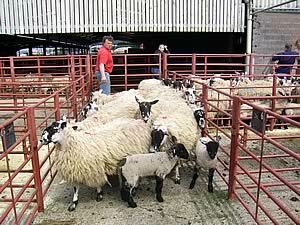 Top of £91 and £79 for Texel hoggs with singles from Reagill Grange; Lleyn £64 Laneside. Shearlings with singles to £80 for Texels from Thompson House; Cheviot Mule £69 Thompson House; Greyface £66 Kinning Hall; Lleyn £60 Laneside. Shearlings with twins to £79 for Greyface from Rabygrange; Zwartbles £65 Rabygrange; Suffolk £64 Tiverton; Lleyn £60 Laneside. Ewes with twins to £77, £76, £75 for Texels from Timpendean, others £75 West Mill Hills; Greyface £69 Timpendean, £65 Moss Side; Suffolk £68 Kilncroft; Cheviot £66.50 West Mill Hills; Blackface £54 Thompson House; Swaledale £45 Bayles; Herdwick £38.50 Bayles. Ewes with singles to £76 for Texels from Timpendean and Cannerhaugh; Greyface £69 Timpendean, £66 Kinning Hall; Suffolk £67 Thompson House; Cheviot £59 Thompson House; Blackface £54 Thompson House, £50 Clover Hill; Swaledale £45 Bayles; Herdwick £38.50 Bayles. Geld hoggs to £87 South Mains. Store hoggs still in demand. Top of £76.50 for Hampshires from Kilncroft; Cheviot £68.50 South Mains; Blackface £68.50 Hallclose; Greyface £62.50 Hallclose. Cast rams to £130 South Mains. Cast ewes to £96.50 Lamberton, hill ewes to £69.50 Lamberton.